The idea of giving a ring as a sign of betrothal isn’t a particularly new one. The Romans were known to swap modest betrothal rings of iron; in later periods they switched over to gold. 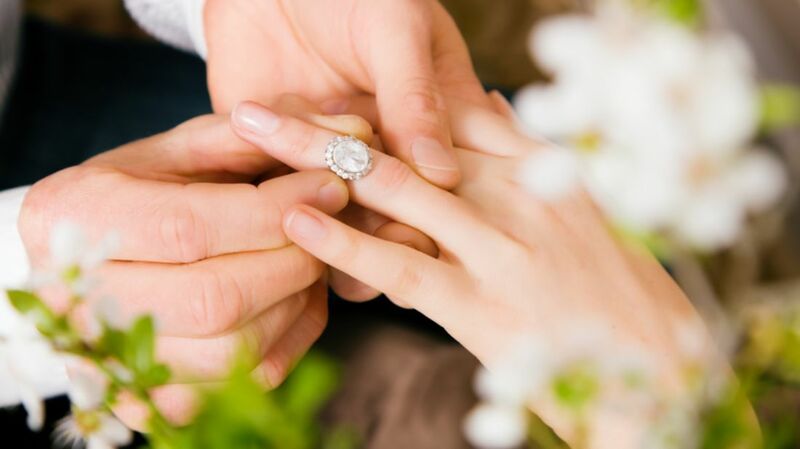 The rings’ popularity hit a lull for hundreds of years before picking back up in the 12th century, when Pope Innocent III laid down some new ground rules about weddings. All weddings had to take place in a church, and the bride had to receive a ring. Moreover, couples had to observe a new waiting period between their betrothal and marriage. European aristocrats began giving engagement rings to their beloveds while they counted down the days until they could actually wed. Engagement rings still weren’t quite the wedding staple that they are now. Other customs competed against slipping a ring on a bride-to-be’s finger. In England, one practice involved the man and woman breaking a piece of gold or silver and each keeping half. They would then drink a glass of wine, and the engagement was on. As late as the 19th century, some American women received thimbles as symbols of their engagements; after the wedding they would often cut the bottom off of their thimbles and wear them as rings. While engagement rings have been around for centuries, diamonds are a fairly late addition to the party. For many years, there simply weren’t all that many diamonds on the world market, so diamond engagement rings were pretty rare. The rock Archduke Maximilian of Austria gave to Mary of Burgundy in 1477 was an early exception. Despite that high-profile ring, things stayed pretty quiet on the diamond front through the late 19th century. In the 1870s, though, miners began discovering huge veins of diamonds in South Africa, and ice started flooding onto world markets. Diamonds had quickly gone from being a scarce gem to a pretty common commodity, which was bad news for everyone in the diamond business who wanted to fetch high prices for their wares. These mine owners realized they would have to be clever if they wanted to keep getting top dollar for an increasingly common gem. It didn’t take long for the producers to hit on a plan. In 1888 several major South African mines merged together to form De Beers Consolidated Mines, Ltd. The merger created a cartel that could effectively control the flow of diamonds from South Africa onto world markets. As diamonds became scarcer and more valuable, their popularity as the gem on engagement rings began to rise, too. A Diamond Is Forever. Since When? That explains how De Beers helped prop up the price of diamonds and create an illusion of scarcity, but how did diamonds become such an integral part of the marriage process? Depending on your point of view, you can thank or blame De Beers for that one, too. While we may think of the diamond engagement ring as a time-honored tradition, it’s really just the end result of a brilliant marketing plan De Beers rolled out in the late 1930s. The agency’s campaign was undoubtedly one of the most effective of all time. N.W. Ayer embarked on a multi-pronged attack that completely overhauled Americans’ view of diamonds. The agency got Hollywood’s biggest stars to wear diamonds and encouraged leading fashion designers to talk up diamond rings as an emerging trend. The plan worked beautifully; in the first three years of the campaign American diamond sales shot up by over 50 percent. Those results were certainly encouraging for the diamond industry, but the De Beers-N.W. Ayer partnership hadn’t even played its masterstroke yet. In 1947, Ayer copywriter Frances Gerety penned the slogan “A Diamond is Forever,” a line so elegant and effective De Beers is still using it almost 70 years later. The slogan helped underscore the diamond’s significance as an enduring, unbreakable symbol of love, and the sales of diamond engagement rings shot through the roof. Within 20 years, 80 percent of American brides were sporting rocks. Should She Give It Back? With so much money moving around, engagement rings have become both symbols of love and valuable assets. Naturally, when engagements go sour, both parties would like to end up with the rock. It would seem courteous for the person who breaks off the engagement to let the other party keep the ring, but the situations are often not that simple. Rings are tricky little things from a legal point of view, and the laws governing who gets to keep the bling if the engagement flounders vary by state. Some states, like New York, hold that the ring is a “conditional gift” given on the condition that the marriage actually takes place. If the marriage doesn’t come through in these states the condition hasn’t been met, and ownership of the ring reverts to the giver. Other states, like Montana, view a wedding ring as a normal gift that can’t legally be taken back once given. But wait, it gets more complicated! Many states view the rings differently if they’re given on a birthday or a holiday. At that point, they’re just regular old gifts, not conditional ones. Hence, the law entitles the woman to keep the ring even if she breaks off the engagement. International laws are a bit different. Those polite Canadians have a rule that whichever party breaks the engagement forfeits all claim to the rock. British law holds that a fiancée can only be forced to legally give up her ring if there were a previous agreement dictating that condition in place. Given all these potential headaches and marketing manipulation, why buy an engagement ring in the first place? De Beers chairman Nicky Oppenheimer probably put it best in 1999 when he said, “Diamonds are intrinsically worthless, except for the deep psychological need they fill."